After planning and implementing four summers of Peacebuilders camp, we’d gotten pretty comfortable with the programs and activities that we’ve been offering to our campers. With more and more campers returning to us, though, and new issues vying for attention in our world, we knew it was time to mix things up a bit, step outside of our comfort zone, and see what magic could happen with new experiences, new facilitators, and new rights to focus on. Consequently, our fifth year of camp this past summer included several never-before-tried activities for both our younger and our older campers. In fact, the majority of the experiences in our second week for our 13- and 14-year olds were new to our curriculum. We are happy to report that, without exception, they were all great successes! Among these new additions to camp was a visit from Liberia Orphans Education Project founders to share with us about their work in bringing the right to education to children in Liberia; an international cooking (and eating!) project; a mock Supreme Court case facilitated by Marilyn Primovic, a dynamic public defender; and a field trip to Columbus to meet with School of Americas Watch founder Roy Bourgeois and try our skill on an aerial course overlooking the Chattahoochee River. In each of these activities, we encouraged our campers to step outside their comfort zones right along with us. It was marvelous to watch campers push themselves beyond what they thought they were capable of on the aerial course, to discover new and different tastes in the foods from Burma, Liberia, and Uruguay, and to listen to Father Roy describe his acts of civil disobedience. But perhaps the farthest venture outside the comfort zone for seven of our campers came on Thursday morning, when they accompanied some of our counselors and one Koinonia community member to Stewart Detention Center in Lumpkin, GA, about 40 minutes from Americus. In this facility, over 1,900 immigrant men are incarcerated, awaiting almost certain deportation to their countries of origin. These seven campers, who had chosen to visit with men detained at the center, were full of anxiety as we approached the medium security facility. They had been coached in what to expect, but nothing quite prepares visitors of any age to the stark reality of the barbed wire, double gates, multiple security cameras, and intimidating facade of the prison. After a brief wait in the waiting area, we were escorted to the drab room where we spent the next hour visiting with four Latino men. Visits were conducted over telephones and through plexiglass windows, and started with nervous introductions and timid questions. Before long, however, campers and men were sharing jokes, stories, and a few tears. Our campers brought joy to these men who rarely receive visitors, and in turn received insight and advice, and more than anything, an appreciation of the human bond that connects all people, regardless of their circumstances or background. As Olivia’s words attest, magic happened that day in the visiting area of an intimidating detention facility in the remote town of Lumpkin, Georgia, far from much of anything familiar or comforting to our campers. 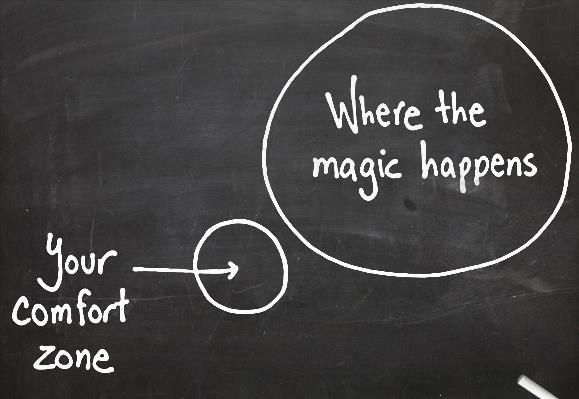 Our challenge to you is to look for ways to step outside your own comfort zone, and find the magic that happens there. We invite you to stretch beyond your own boundaries, and, like our campers, connect in courageous and meaningful ways with people different from yourself. It might just change your perspective; it might just change your life!